Taking a break from my Christmassy poetry to revisit as place which seems to be growing ever more a part of my life: the Busselton Jetty, a mile long jetty about half an hour from where I live. 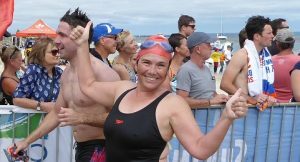 I’m currently in training to do the swim again in February – though I am hoping it will be a slightly flatter sea. Speaking of training, there is a third way to traverse the jetty: a little train which runs the length of the jetty. It’s slow, and although it looks fun, I’ve never done it before. 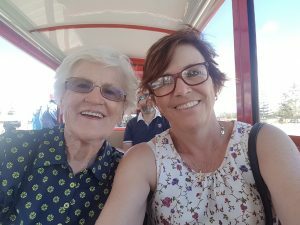 But yesterday, I righted that wrong and finally travelled on the little red train, taking my mother with me As well as the train ride I had another new experience: under the jetty, at the end, is an observatory. 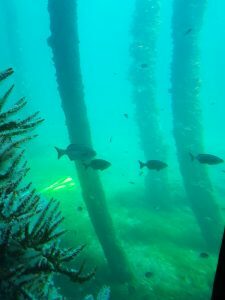 It’s one of only a few underwater observatories in the world and is unique because it there are no captive or introduced fish. All the sea life you can see is there because it lives there. 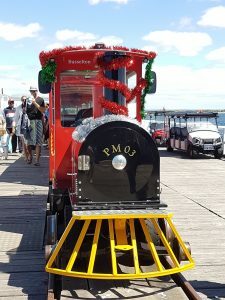 SO, the thing is, although I’d walked along the jetty and I’d swum around the jetty, not only had I never ridden the train along the jetty, but I’d also never visited the observatory. I’d always intended to, but hadn’t got there – in part because I am a bit claustrophobic and wasn’t sure how I would feel. But my mum, who lives nearby , and had visited once before when it was new, really wanted to go again. So we had a mother-daughter date, and we went and it was amazing. See – mums really do know best! Schools of fishes swimming by me. 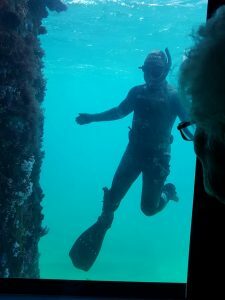 A lone diver waving at me! Both fish and diver are wetter than me! The diver was a bit of a surprise. And, when he realised we could see him, he put on a bit of a show for us. I couldn’t figure out how to work the lovely coral and algae growing on the jetty pylons into the poem, but here’s a little peek. Have a great poetry Friday. The round up today is being hosted over at Random Noodling. Head over there for more poetry goodies. Love your photography and the poetry with it. Such an adventures. How fun! Enjoy every moment with your mum. I’m on a train going home right now from a whirlwind trip to NYC. My baskets are FULL of words. I’ll share soon. Love how you spent your date and the words that swam to you. I look forward to seeing what’s in your basket,Linda. Someday I’m coming down to swim around the jetty with you! That’s on my bucket list of ultimate open water swims! Oh you so should,Mary. It’s a good ‘un. That underwater observatory looks magical! I’m so glad your mom nudged you to go and you shared that experience with her and then with us. Love your spirit of adventure, Sally! Thanks Molly. Life is good. Thanks for taking all of us “Under the Sea” with you, I love your poem, and what a fantastic experience! 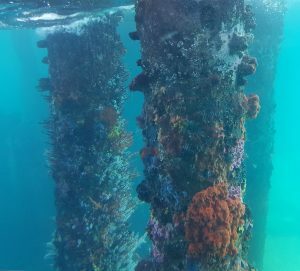 The pictures are wonderful, and now you’ve swum, walked around, and been below the Jetty, there’s only one more spot of this Jetty to visit… Thanks for fun post Sally. Whoa! What an accomplishment. And how cute are you and your mom. Sweet! Wow! I could handle walking out on the jetty, but I am impressed that you swam around it! That observatory sounds incredible. Thank you for sharing your photos and poems. YOU are the adventurer. A mile out to see in myriad ways. Brava! for your Mom-date to undersea & a rail trail. This post leaves me euphoric, Sally. Appreciations! Thanks Tabatha. Yes, the observatory has a winding staircase, and windows at different levels so you can see up as well a out , which reduces the claustrophobia. Those coral are beautiful. I know you will write something amazing for them — the lichen of the sea. Thanks Brenda. Yes, the colours are amazing. It truly sounds like a magical place, Sally, walking, swimming and now a train, then underwater! I’m glad your mother nudged you to go “under the sea”. I wish I was that close to the ocean! Thanks Linda. I do feel pretty lucky to live where I do. Sally, you and Mum sure keep busy! I envisioned the jetty as a narrow walkway–until you mentioned the railroad! How wide is it? Just the thought of a February swim makes me shiver–of course your February is warm, whereas ours are frigid! Hi Diane.I think it’s about 10 meters wide. the train is one of those motorised tourist things,so not huge. February is usually our hottest month,so plenty warm enough. Thank you Irene.Such a lovely comment. And yes, the word jetty is a good one, isn’t it? Thanks Kat. I suspect there are actually five ways – via poetry, but also it can be experienced visually, too. It’s one of the most photographed landmarks in WA. I get the sense of spirit of place in your continuing connection to the jetty and the words and feelings it evokes Sally. Living so close to the sea, as I do at Mornington, identifying with your poems and your place in the world is an easy thing to visualize. Thanks Alan. Sounds like we are both edge-people. Your story brought me back to the Jersey Shore where we loved exploring the jetties for star fish, etc. I never swam around one though. Afraid the breakers would crash me against the stones! Brave you! Maybe brave, maybe crazy. But there are no rocks near my jetty – and usually it’s really calm. Thanks for visiting.